Boys should be powerful, furiously aggressive, and revered. Girls should be pretty, happy, cherished and indulged. Word-based baby names like Thunder or Empress offer a unique window onto our culture, because they’re the clearest signals in the usually complex realm of names. Every name from Aaron to Zora has its own place in our social world and sends its own messages. In most cases, though, those messages are hard to pin down. Not with a modern word name. When parents name a child Thunder or Empress, you have a clear idea of what image they want the name to project and what dream it embodies. The signals are spelled out before you. That makes word names, and particularly new word-name trends, a stark barometer of cultural values and attitudes. In generations past, they followed predictable lines. Most of the familiar, traditional word names were given to girls, and celebrated either virtue (e.g. Patience and Faith) or natural beauty as an embodiment of the feminine ideal (Pearl, Violet). The late 20th Century updated the theme with some splashier and more diverse choices (Crystal, Ebony, Destiny), but the basic form mostly held true. Then in the 21st Century, word names blew wide open. A revolution in baby naming obliterated the boundaries that used to restrain parents’ choices. Over the past generation, baby namers have largely turned away from the old standard names in pursuit of impact and novelty. Word names are a rich source of both, and this time, nature and virtues are just the beginning. Any appealing word is fair game—for girls and boys alike. This wave of new word names has entered a new world, one with a dramatically different conception of gender roles compared to eras past. One might expect, then, that the new names would break the mold of traditional gender stereotypes. One would be wrong. In fact, many parents are using their new creative freedom to push the old-fashioned images of “girl” and “boy” to new extremes. New names exclusive to girls include Allure, Paradise, Pristine, Lace, Happiness, Couture, Heiress, Fantasia, Tulip, Gracious, and Gorgeous. New names exclusive to boys include Savage, Clash, Diesel, Thunder, Champion, Almighty, Chaos, Trigger, Danger, Power, and Rage. Such new, eye-catching word names make up only a modest slice of America’s total naming culture. But it’s a growing slice, and a relatively diverse one. Pairs of siblings named Indigo and Fable, Trigger and Trooper, and Majesty and Messiah are likely to represent families of very different backgrounds and communities. And as strong signals, they both reveal and influence the cultures of those communities. A strongly styled word name is more than just a fashion choice. It can shape a person’s entire experience of the social world. Imagine meeting a person named Savage compared to a person named Tulip, or seeing each of those names on an email, or a resume, or a Tinder profile. The name creates a bubble of responses and expectations that will surround the bearer throughout life. It also, of course, sends a message of values and expectations to the child herself/himself. We’re looking at what thousands of boys and girls are told to be from the moment they take their first breaths. This ranking may seem extreme, but there’s reason to believe that it significantly underestimates the phenomenon. First off, not all of the names within a category are equivalent. Within the “animals” category, for instance, overwhelmingly female names include Gazelle and Sparrow; overwhelmingly male names include Lion and Bear. We are literally naming boys after predators and girls after prey. What’s more, my methodology was strict in excluding names that had more than a tiny history of past usage. That means that many word names that are currently experiencing an unprecedented surge of popularity went uncounted. The male dominance of the “Exaltation/Praise” category, for instance, doesn’t even account for the 1,222 boys named Ace last year, vs. just 10 girls. The apparent evenhandedness of the “Reign” category doesn’t reflect the most popular regal names, like King. 2,661 boys were named King, while only 234 girls were named Queen. In fact, every word name ranked among the 100 most popular baby names went uncounted, including the likes of Maverick and Hunter for boys and Autumn and Serenity for girls. Those four names alone were given to more than 18,000 babies last year. 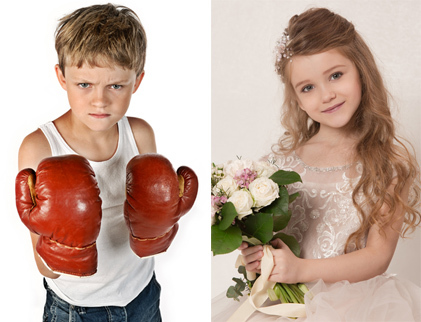 The fact that boys are more likely to be named Steel and girls Lace may not be a surprise. More striking, I think, is the emotional tone these names set. It’s not just that we like to picture our daughters as ethereal and our sons as powerful. It’s that we apparently like to picture our daughters as happy, and our sons in a state of rage. The most extreme, farthest apart categories of meaning names according to the gender ratios are Power and Joy. Can those really be opposites? And do we really want to deprive half of society of either?